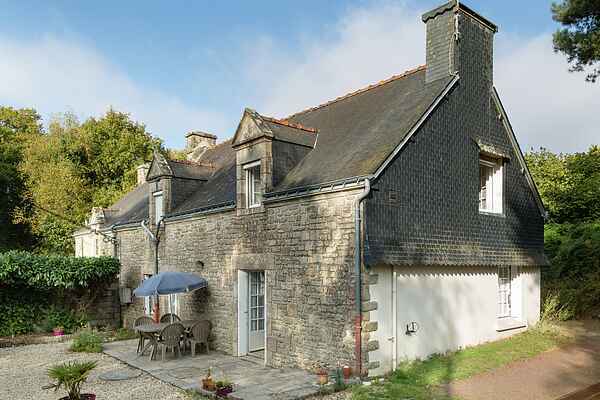 Authentic Breton vacation home with private swimming pool. It dates from the 19th century and sits peacefully \"à la campagne\" at the edge of the quiet village of Billio. From your house you can walk into the fields with nice roads, suitable for lovely bike rides through the forests and historic towns. The house is attached to another house, but both have private, fenced grounds and the needed privacy. Not far is the medieval Josselin (11 km), founded in 1008 and known for its architecture. Visit one of the famous castles of Brittany here. From the river Oust the castle is extremely photogenic and a doll museum is housed in the former stables . Fresh baguettes and croissants you can get the morning on foot at the grocery store in Billio (100 m). Groceries, tennis court and restaurant in Plumelec (4 km). Groceries, tennis court and restaurant in Plumelec (4 km). At 20 km lies the beautiful recreational lake Etang au Duc near Ploërmel. Here you can go sailing, pedal boating and surfing. The coast and sandy beaches of Brittany can be reached at Vannes (25 km), a beautiful town with half-timbered facades, nice shopping streets, restaurants and boat trips through the Gulf of Morbihan, an impressive nature reserve crowded with islands.